Stymie: It might choke Arty, but it ain’t gonna choke Stymie! Whenever I hear someone say Artichoke I think of that line from the Little Rascals. I remember my mom making stuffed artichokes when I was younger but I was not a fan then. I slowly came around to them, just like tomatoes. One thing at a time, first it was okay in dips, then marinated in salads, and now I even cooked them for our dinner! Over the weekend I went to grocery store and artichokes were on sale. Crazy on sale…. I got 7 for about $3. I could not pass them up so I called my mom when I was there to find out how she made stuffed artichokes. Luckily, she told me how easy they were so I planned for them to be our dinner on Sunday night. To be quite honest I don’t have a recipe for this because I just winged it. My mom told me what was in the filling but no amounts so I just got to work and made it up as i went along. I think I was a little heavy on the hot pepper but the amount of garlic and cheese was good. 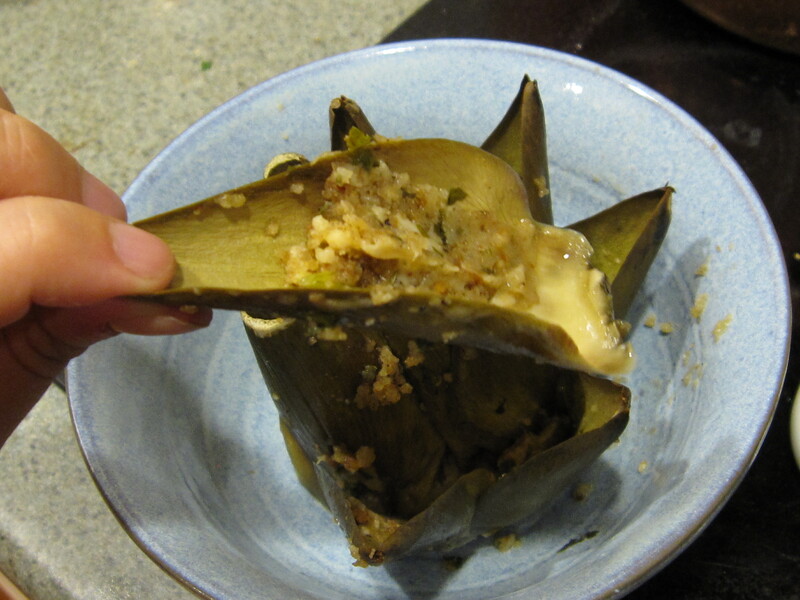 They are easy to eat- snap off a leaf and scrape off the filling and ‘choke with your teeth. Plus, I was able to add all the post meal leaves to our compost. Mix breadcrumbs, cheese, parsley, garlic, and seasonings together in a bowl. 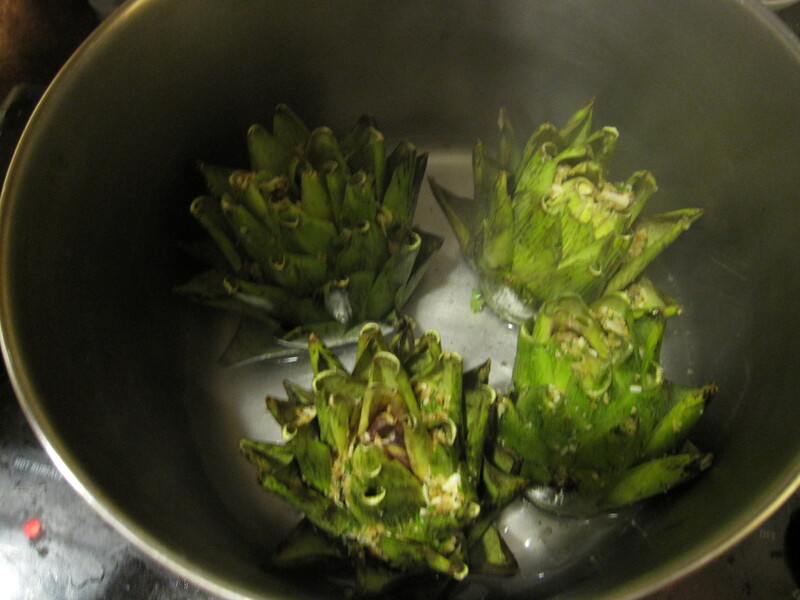 Add olive oil to make a paste to stuff into artichoke. 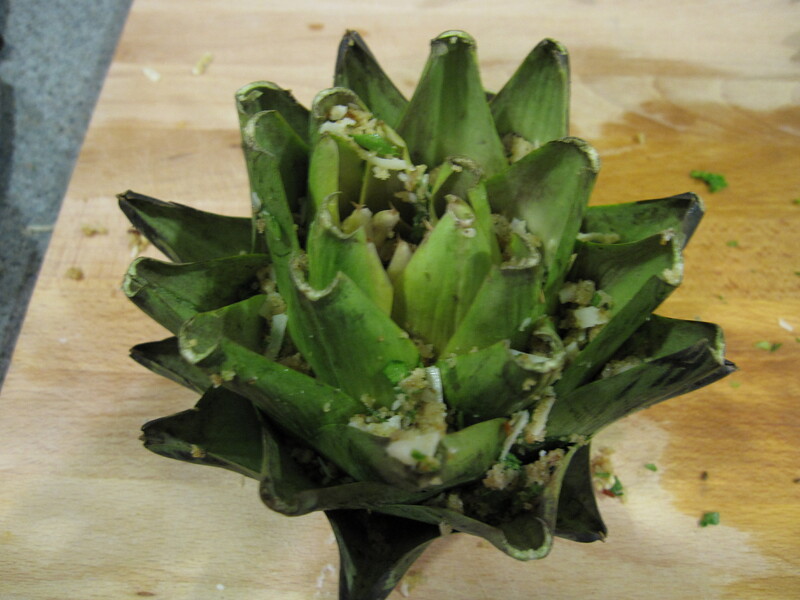 Artichokes need to be prepped by carefully opening them up. Trim away the tips as you go. Wash them at this point and trip the bottom so it sits evenly. Separate the leaves to you have room for the stuffing. Stuff the artichokes.